Retreat to the peaceful flow of Tanglewood Resort in Pottsboro TX. Located on beautiful Lake Texoma, this spectacular resort offers comfortable lodging, a wide array of inspiring activities, meeting rooms and a well versed, qualified staff members sure to make your stay fun and memories made. From extraordinary dining to a more relaxed pool-side location at Barnacles Sports Bar, Tanglewood Resort offers a varied range of resort accommodations that will allow you to: Relax the day away at one of the 3 pools or hot tub. One can also take advantage of the volleyball sandy areas, basketball court, horseshoes pits, or play a game of tennis at one of the lighted tennis courts, or just kick back and relax. Whatever your flavor is Tanglewood Resort is sure to have it available for you. 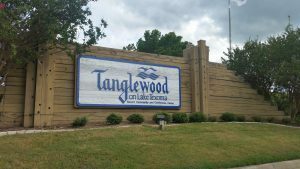 What kind of rooms can you expect at Tanglewood Resort? Tanglewood is Pet friendly as well. Bring your Fur baby along to enjoy a vacation on Lake Texoma. Golf at Tanglewood Resort is amazing there is an eco-friendly grass that is sought after all over the world. Enjoy a round of golf on this private 18-hole championship course designed by the legendary Arnold Palmer and renowned architect Ralph Plummer. Tanglewood Gold boasts a 7,000-yard course which features lush Bermuda fairways and is a sure to bring the best golfers out for challenge to any level golfer. There is so much to do at Tanglewood Resort and Marina. Boat Cruise’s, hiking, Horseback riding, pickle ball, board games and much more. Lake Texoma stretches for miles and miles the views are amazing. Spend the day at the sandy beach taking in the sunshine. The setting is sure to bring joy and many memories.